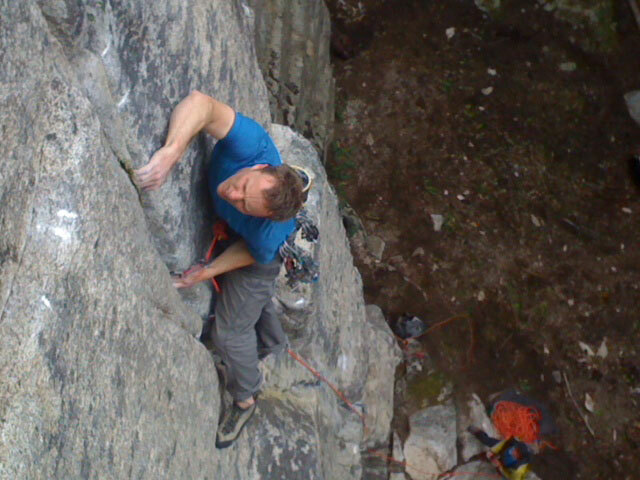 One of the best finds in the last several decades, recent and rapid development of this impressive crag has significantly increased the amount of high quality 5.11-5.12 climbs available in Squamish. With close to 40 established pitches and new lines being established on regular basis this excellent area is easily as good as the best crags in the Sea to Sky corridor. The Top Shelf is a destination crag for the visiting climber and a treasure trove of new classics for the seasoned local. 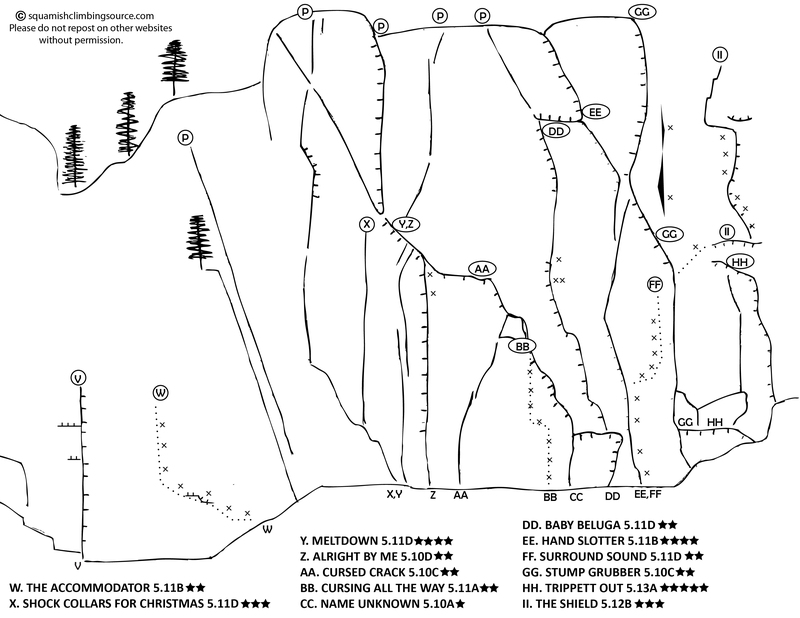 Although there is one established four pitch line, Low Class Stump Grubber, and more multi-pitches under development, the area currently features predominantly single pitch climbing. The walls are vertical to gently overhung. The climbing is on mostly traditionally protected, crack features. 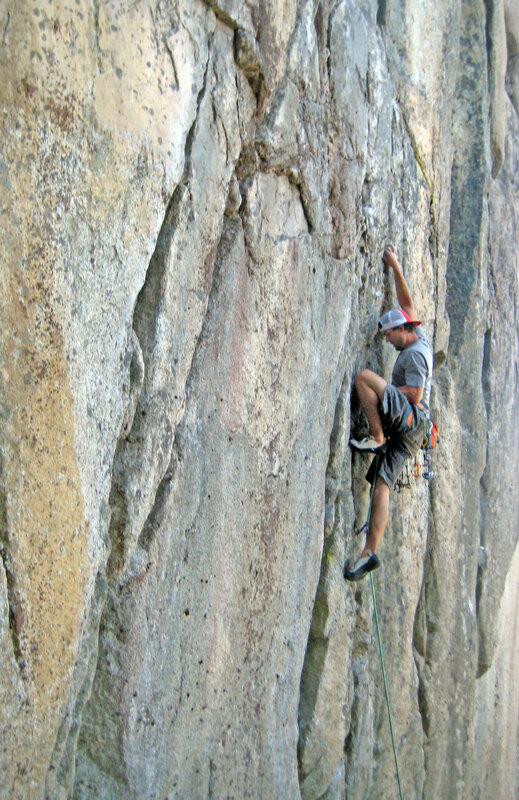 The nature of these climbs is generally more gymnastic and varied than other steep crack climbing venues like Nightmare Rock or The Longhouse. Pump control, strenuous gear placement, and willingness to go for it above your gear are the keys to success on many of the routes. Several excellent bolted routes round out the collection of pitches. Treasures hidden in the rainforest. The described area is the lower right cluster of stone. Most of the climbing is obscured by trees. Click on image to enlarge for detail. Ironically, when viewed from the valley, these are some of the least impressive looking walls among the acres of untapped granite to the east of the main Squaw area. Most of the climbing is hidden from view by the giant trees along the base. Many of the climbs remain dry in light rain, the cliff drys very quickly after heavy rainfall, and has very few the perennial wet seeps so common in the region. 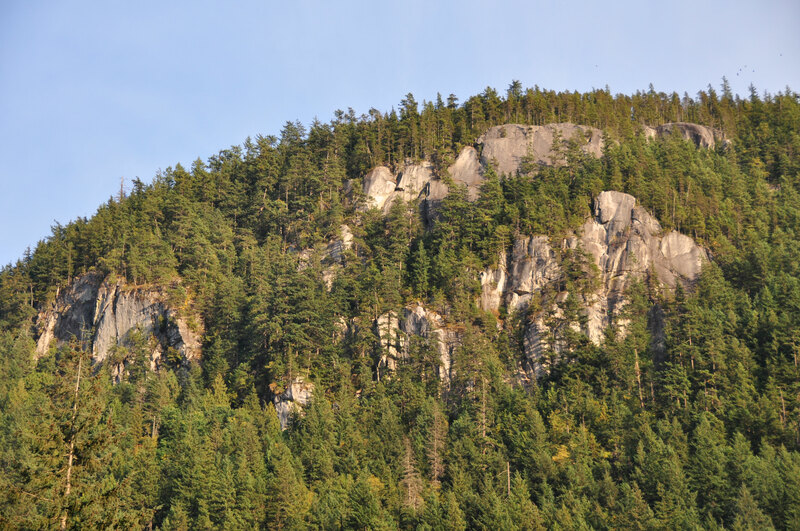 The northerly aspect makes for one of the shadier crags in Squamish. Located 300 meters above Valleycliffe, this lofty setting has beautiful views and the urban drone of Squamish is pleasantly muted. The upper tiers have several more crags and climbs, but this page will cover only the lower tier for the time being. The north west facing cliffs are located on the far east end of the greater Slhanny (Squaw) massif. The area is clearly visible from the valley. The trailhead is located 2.7 km (1.7 miles) along the Mamquam FSR. There are several decent pullouts near the trailhead. The trail is well established and easy to follow, rapidly gaining over 300m in elevation. Approach time varies between 25-35 minutes depending on how much of the rack you managed to sneak into your partners pack. Eye Catcher is the first climb encountered, a very obvious and aesthetic dihedral. Cursing All The Way 5.11a. Loose rock. A grossly underestimated hazard in Squamish in general, and the biggest hazard at the Top Shelf specifically. Although the routes are generally on the best granite you will ever touch, new routes are especially prone having holds and blocks pull off. It is not the responsibility of the new route developer to ensure every last flake, block, or hold is absolutely solid. It is your responsibility to ensure your own and your partners safety. The area is still under heavy development by a small group of individuals who are used to having the place to themselves, route cleaning involves much intentional and unintentional trundling, it is your responsibility to make sure you are not below route developers. Much of the future development is and will be taking place on upper tiers and the possibility of rockfall making it to the bottom tier is very real. There are numerous unclimbed projects, not all of which are listed, nor do all have red tags. Respect the efforts of route developers and stay off. 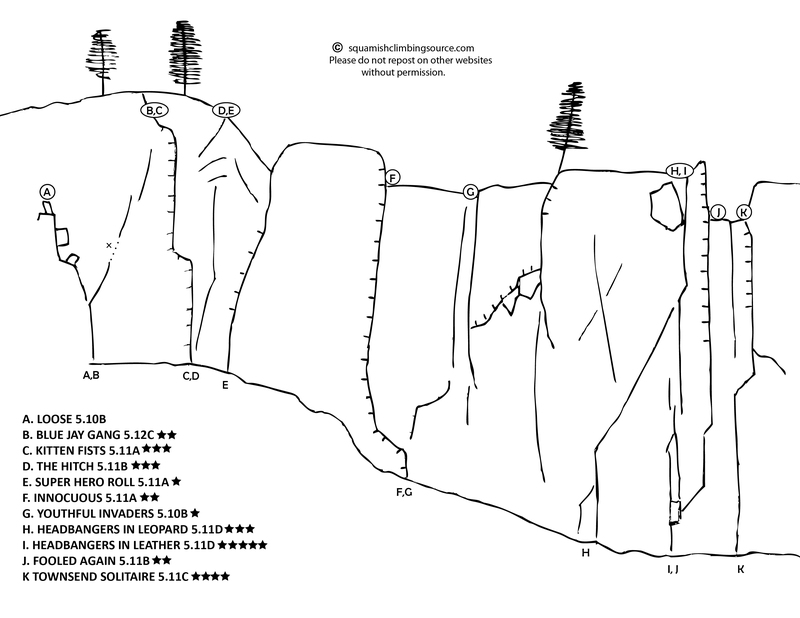 If you found a perfectly clean climb not shown in the topo, it is probably a project that hasn’t been sent by the the developer who spent a great deal of time making it perfectly clean. The established routes will likely keep you busy for several seasons. Please don’t “borrow” equipment from any gear stashes left at the cliff by route developers. With the exception of Stump Grubbers and The Shield, all route are single pitch. All the listed routes can be lowered off with a 60m rope, Hand Slotter, Persistence, and Baby Beluga are rope stretchers (30+ meters) and care has to be taken with belayer positioning to avoid being lowered off the end of the rope. The climbs are fairly gear intensive with many routes requiring triples of some sizes.Thin fingers to tight hands size being a dominant theme on most climbs. The bolted pitches often require a few pieces of gear. Most routes are equipped with fixed lower off biners, if you don’t like this system then don’t climb these routes and do not remove these biners do replace heavily grooved or sticky gate biners with your own leaver biners. 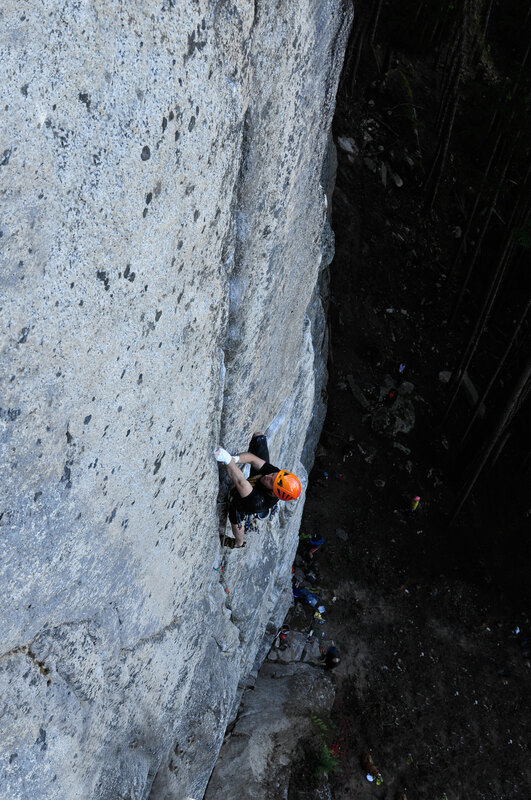 S.T.Dominates Headbangers in Leather 5.11d. Both are very subjective and open to debate. 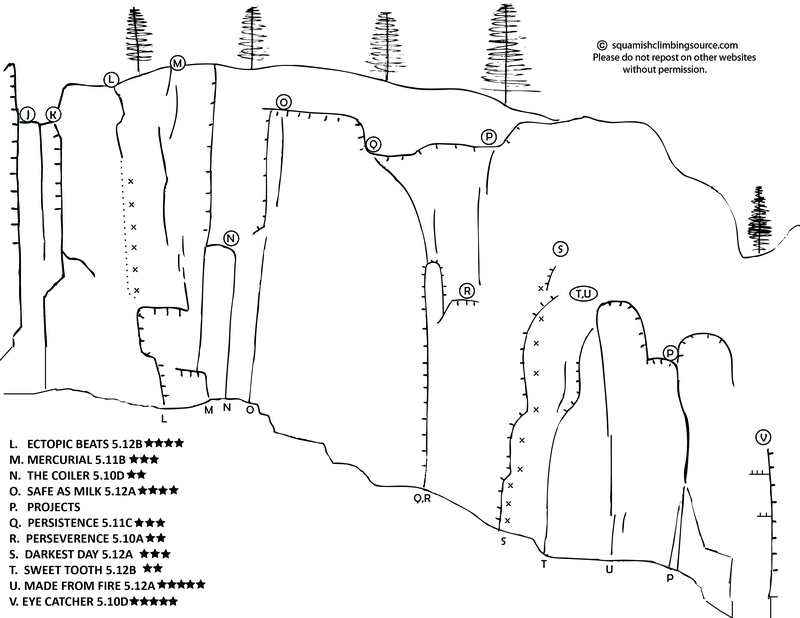 The grades are fairly consistent with similar style routes at other granite climbing areas like Yosemite or Index. If you expect these routes to feel like The Smoke Bluffs or The Forgotten Wall prepare to get schooled. Shock Collars For Christmas 5.12a. Well now the cat is out of the bag. Although some will be bummed that the quiet little locals area is on the map, most will be happy to see some new faces or any faces up there. The only thing that is cooler than being part of initial development of a secret new area is going back to the same area and seeing loads of folks jumping on routes, sending, flailing, but most important of all grinning from ear to ear.